Harpist, born in Cracow, Poland. In 2001 she obtained her master’s degree in performance at the Academy of Music in Cracow, where she studied harp. She has guest appearances with the following ensembles: Sinfonietta Cracovia, Amadeus, Silesian Opera, Sinfonia Varsovia, Sinfonia Iuventus, The National Philharmonic, The National Theater, various Polish Philharmonics as well as the K&K Philharmoniker, Alvarez Chamber Orchestra, Filharmonie Bohuslava Martinu, Slovak Sinfonietta and Orquestra do Norte. EB took part in many performances of symphonic, oratorial and chamber works. Many of them have been composed with her being leading performer in mind: B. Scheaffer - Concerto for the harp, Sonata for the violin and the harp, Fur Elise for violin and harp, M. Negrey - Vitis Mistica, A. Walacinski - Hieroglif, M. Ptaszynska - Euridice's Dream, M. Mengjiqi - Quae mane oramus, T. Pehlken - Drei Gesanges, Sz. Tesarowicz- Tchnienie milosci, Cantate for soprano, harp and children choir. EB works with Center for Theatre Practises " Gardzienice". Along with solo recitals, she was also a soloist in several chamber music orchestras including Concerto Lamelli, George Telemann's Orchestra, Sinfonietta and Forum Sinfonia. EB worked with: Placido Domingo, Thomas Hampson, Ute Lemper, Maxim Vengerov, Jon Lord, Joe Hisaishi, Alena Baeva, Tan Dun, Cinematic Orchestra, Kevin Kenner, Vadim Brodski, Małgorzata Walewska, Elżbieta Towarnicka, Vittorio Griogolo, Gheorghe Zamfir, Pieter Wispelwey, Radovan Vlatkovic, Thomas Bauer and many other. EB took part in auditions and live broadcasts, performing with distinguished conductors (L.Maazel, M. Minkowski, K.Penderecki, H.Riling, J.Maksymiuk, L.Wicki, L.Livingstone, E. Kohn, J.Axelrod, G.Chmura, A. Wit, K.Kord, J.Krentz,etc.) and recording for many Polish TV and radio stations. She was also active in the Internationale Bach Akademie and the Internationale Junge Orchester Akademie. She established her own ensemble playing a wide variety of musical styles from classical to popular. 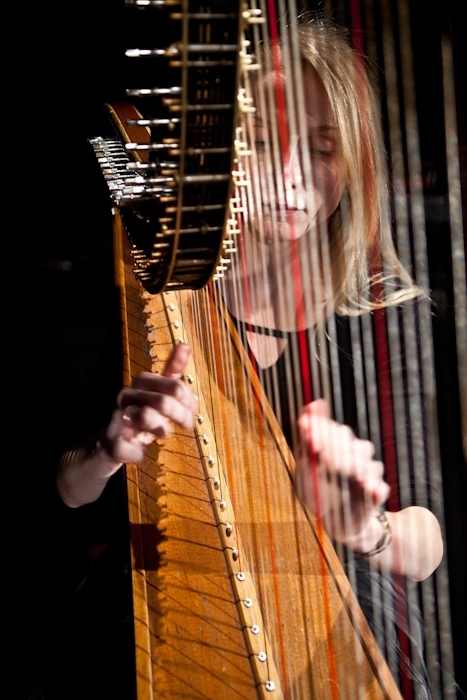 Elzbieta Baklarz plays Lyon&Healy and Horngacher harps.